Oropesa is found in central Spain in the region of Castile La Mancha. 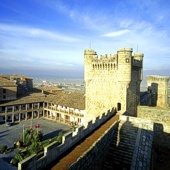 It is one of the oldest inhabited sites in Spain, and one of its main attractions is the 14th century Castle, which restored by Don Garcia Alvarez of Toledo in 1366. Over the centuries, the castle had been a refuge for monks, soldiers, and weary travellers. 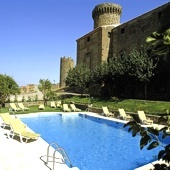 Today it continues to offer accommodation to visitors, as it has since been converted into a Parador. 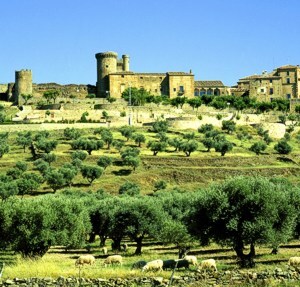 The Parador Oropesa (Hotel Hostal Virrey de Toledo) is a luxury four star hotel with exceptional views of the vineyards, olive groves and the snow-capped mountains of Gredos. It has a seasonal swimming pool with its own bar and restaurant. Whereas Toledo is famous for its roast lamb dishes, Oropesa cuisine is predominately game and seasonal produce. If you have a car at your disposal, there are also many things to explore in the surrounding area, starting with the ruins of the ancient Muslim city of Vascos. Vascos is bordered by two rivers and entered through horseshoe arched gates. Dating back to the 9th century, its fortress was built on the remains of a tower from the Roman era. There is also a Citadel at the northern part of the city, and two cemeteries, one of which is walled, with ancient baths located next to the Mora Stream. Just north of Oropesa is Aquila Cave, formed by ancient rocks that date back 500 million years, and was only discovered as recently as 1969 by a local farmer. Each chamber within has been given a special name, to reflect its impressive colours and shape. There are also a variety of speleothems which are mineral formations that cover the ceilings, walls and floors. So fascinating are its features, that the cave has been declared a National Monument. East of Oropesa is the city of Toledo, which is not only the capital of the province, but was originally the capital of Spain until the 16th century. The historical part of Toledo stands majestically on a hilltop and, because of its wealth of ancient buildings, it has been declared a World Heritage Site. Its Gothic Cathedral has a wonderful collection of paintings by famous artists such as Goya, Van Dyke and El Greco. It also has two very precious illustrated bibles, which date back to the 13th century. El Greco actually lived in Toledo, and his house is now a museum with one of his most famous paintings ‘The Burial of the Count of Orgaz, exhibited in the Museum Parroquia de Santo Tome. There are always a number of events throughout the year, such as Medieval Days and a special Carnival. In September they celebrate their two main festivals; a three day annual religious festival at the beginning of the month, and the Beato Alonso closer to the end. During winter they also hold a craft market with traditional games, entertainment and activities such as archery. There is even a Christmas dessert contest! With so much going on, and you are after a historical or cultural holiday as well, Oropesa and Toledo will not disappoint you.